Seattle, WA – High in the Andes mountains in Peru’s Sacred Valley, the majority of people live in isolated villages, many without running water or electricity. Some also lack road access throughout the year due to harsh weather. These conditions make access to quality health care difficult. To aid the inhabitants, Sacred Valley Health enlisted local health workers to provide basic health care and education in Peru’s Andes mountains. It was while on an adventure trip to nearby Machu Picchu that Microsoft executive, Don Morrison, witnessed these workers in action. “It was clear to me that they made a tremendous impact saving lives and improving the quality of life in challenging conditions, but they were doing it all manually, without any modern technology at all,” said Morrison. “They were hand writing or drawing their content which was easily destroyed by weather and other effects of their work. I knew Microsoft could help,” said Morrison. Upon his return from Machu Picchu, Morrison drafted a digital transformation plan for Sacred Valley Health. He raised funds via Microsoft’s annual Give Campaign and created a partnership with Microsoft’s Peruvian Subsidiary. He then returned to the area to visit each of the remote communities and interviewed Sacred Valley Health’s staff in Ollantaytambo to ensure the right solution would be delivered. Through Morrison’s persistence and Microsoft’s support, SVH workers now use advanced technology to serve 13 remote communities where water, electricity and health care facilities are scarce. The computers were delivered in May 2017 and the SVH team are now integrating them into their processes. Over the next six months, SVH and Microsoft will work together with the technology to ensure success. But the good works don’t stop there. An avid adventure traveler, Morrison has embraced the travel-with-purpose concept and plans to apply it to future projects in future travels. “I rely on the hospitality of local people and their culture when I travel. I want to give back in a way that makes a real impact on lives,” said Morrison. He is currently working on a similar project to bring basic computing and digital literacy to an orphanage in south Peru. About Don Morrison: Don Morrison is currently the US Director for the Software Asset Management business at Microsoft. In his previous Microsoft role, he was the US Small and Medium Customer and Partner Experience Director. During his tenure at Microsoft, he led teams that grew top line revenue 10x, improved the Net Satisfaction of customers for 9 consecutive waves and been instrumental in sharing best practices worldwide. His entire career has been in high tech and he has held executive positions at Sage Software, Electric Lightwave, Tektronix and others. He holds an MBA in Finance and a BS in Marketing. Don currently lives in Washington State with his family where he enjoys the outdoors, sports and time with friends. 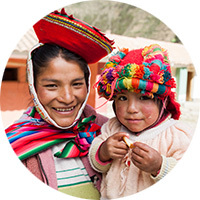 About Sacred Valley Health: Founded in 2012, Sacred Valley Health promotes health in the underserved rural communities of Peru’s Sacred Valley through a health education program. These Quechua-speaking indigenous communities exist in the harsh environment of the high Andes Mountains and clinics are few and far between. In addition to training its 50 health workers, Sacred Valley Health runs a docent (“train-the-trainer”) program, which enables a small group of health workers to receive advanced training to lead educational trainings to existing and new health workers.